-- Republican primary voters avoided a self-inflicted wound in West Virginia when disgraced coal baron Don Blankenship (R) finished third in the GOP Senate primary. -- Much else went as expected Tuesday night. 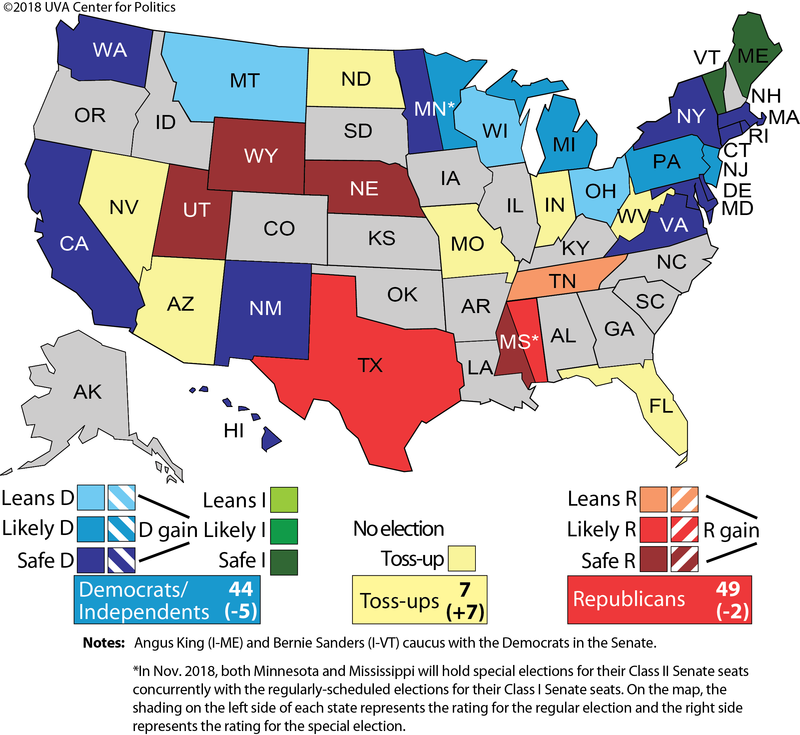 -- Five ratings changes this week affect races for Senate, governor, and House, but most importantly broaden the Senate playing field. Tuesday night's marquee primary came in West Virginia, where rumors based 1 on internal polls 2 suggested that Don Blankenship (R), a disgraced former coal company executive who had recently served jail time for ignoring federal mine safety laws in connection with a mining disaster that killed 29 in 2010, was poised to win the Republican Senate nomination in the Mountain State. Blankenship ended up finishing in third. The anti-Blankenship bubble may have been a way for national Republicans to cajole President Donald Trump into weighing in against Blankenship, which he did on Monday 3. As it turned out, Blankenship probably was never as serious a contender for the nomination as he might have seemed. In any event, Republican primary voters in West Virginia avoided making a silly decision Tuesday. They ultimately picked state Attorney General Patrick Morrisey (R) over second-place finisher Rep. Evan Jenkins (R, WV-3) to face Sen. Joe Manchin (D-WV) in November. We thought Jenkins might be a better choice for Republicans: He is from the southern part of the state where Manchin will need to do well, and Jenkin's party switch prior to his initial 2014 House victory would not have been a liability in a state where changing party allegiance from Democrat to Republican is a common experience for many voters (in 1988, Michael Dukakis carried West Virginia; by 2016, Trump was carrying it by 42 points). Democrats apparently agreed with our assessment of Jenkins' strength because they meddled in the Republican primary 4, with the seeming intention of trying to get Blankenship nominated or, at the very least, to prevent Jenkins' nomination. Still, Morrisey is perfectly capable of beating Manchin, and we're moving the West Virginia Senate race from Leans Democratic to Toss-up. In Indiana, we saw the latest iteration of a familiar story in Republican primaries. A long-expected and nasty two-way battle for a nomination, in this case between Reps. Todd Rokita (R, IN-4) and Luke Messer (R, IN-6), provided an opening for a third candidate, self-funding former state Rep. Mike Braun (R). Braun provided something of a breath of fresh air to voters 5, and he easily won the nomination to face Sen. Joe Donnelly (D-IN) in the fall. Similar kinds of primaries helped lead to the nominations of some prominent Republicans, like Sen. Deb Fischer (R-NE) and Gov. Matt Bevin (R-KY), who did not start their respective nomination battles as favorites but ended up capitalizing on battles among their competitors in multi-candidate fields. To be honest, Messer and Rokita did not impress us all that much in this campaign, and Indiana Republicans may have made a shrewd move in picking Braun, a relative newcomer. That said, Braun also is less vetted than Messer and Rokita, so while he might have a high ceiling as a candidate, he may also have a low floor if Democratic opposition researchers can find holes in his resume. That said, this was a Toss-up before and is a Toss-up now, and we were not planning on changing our rating in Indiana no matter which of the three Republicans got nominated. Donnelly is one of the most vulnerable Senate Democrats in a state that Trump won by 19 points, but he also is a well-liked incumbent who will not be a pushover. Tuesday's one other Senate primary came in Ohio, where Rep. Jim Renacci (R, OH-16) won his primary over businessman Mike Gibbons (R) and others, although Renacci got less than 50% of the vote and perhaps needed a little boost from the president, which he has been getting 6. Incumbent Sen. Sherrod Brown (D-OH) remains a favorite in the fall. We have one other ratings change in the Senate, which is unrelated to Tuesday's primaries. We're downgrading Republican odds in Tennessee, although the GOP remains favored there. As a part of our determination on Tennessee, we also pondered a similar change in Texas, but we decided to leave our rating in the Lone Star State unchanged. In Tennessee, there is more and more evidence that Democrats might have a real chance of winning the open seat of outgoing Sen. Bob Corker (R), who is retiring. A late March poll from Middle Tennessee State University tested the likely general election matchup, finding former Gov. Phil Bredesen (D) ahead of Rep. Marsha Blackburn (R, TN-7) by 10 percentage points, 45%-35%. We were cautious 7 about over-interpreting that result because Tennessee has become a much more Republican state since the mid-2000s. Based on two-party presidential voting, Tennessee's lean in presidential elections relative to the national popular vote margin shifted nearly 18 points toward the GOP from 2004 to 2016. That is, it went from being a state that was 11.9 points more Republican in margin than the country as a whole in the contest between George W. Bush and John Kerry to 29.5 points more Republican in Donald Trump's victory over Hillary Clinton. Only West Virginia (36 points more Republican) and Arkansas (23 points) moved more to the right than Tennessee in that period. Bredesen last ran for office in 2006, when he won a sweeping reelection victory, but that race was in a state far closer to 2004-era Tennessee than the 2016-era Volunteer State. Since MTSU's poll, however, two more nonpartisan polls have seemingly confirmed that a Bredesen win may be quite possible. As shown in Table 2, the three surveys taken since ex-Rep. Stephen Fincher (R) dropped out of the Senate contest in mid-February -- leaving Blackburn practically unopposed for the GOP nomination -- suggest Bredesen is either ahead or tied, and not that far away from the guaranteed win percentage of 50%+1. For a Democrat to be somewhat close to the 50% mark is important because the undecideds lean Republican in identification, and if they vote, they will probably vote Republican. We are moving Tennessee from Likely Republican to Leans Republican, though we will see how things change (or don't change) as the campaign revs up over the next few months. Democrats have spent the last few years earnestly hoping for “Blue Texas” to become a reality. However, the Lone Star State has been more like the green light at the end of Daisy's dock in The Great Gatsby -- a murky, distant, and perhaps unreachable goal for Democrats. Still, the 2018 cycle might present a chance for that seemingly remote dream to come true. A mid-April survey from Quinnipiac University grabbed attention when it found incumbent Sen. Ted Cruz (R) leading Rep. Beto O'Rourke (D, TX-16) just 47%-44%, although Republicans and independent observers questioned it 8. We don't really think this is a three-point race ourselves, but we also don't think it's going to be a typical GOP Texas blowout, either. Given Texas' demographics and the fact that Trump won it by a smaller margin than Iowa in the 2016 presidential election, perhaps Texas has shifted enough to be competitive in a very friendly Democratic environment. Such conditions might be a reality this November, though how favorable things will be for Democrats remains an open question. In the money race, O'Rourke is certainly fundraising like a first tier challenger. Surprisingly, he ended the first quarter of 2018 with more money in his campaign war chest than Cruz, $8.0 million to $7.2 million. To put this in perspective, Cruz raised $15 million in his 2012 Senate bid, which involved a hard-fought primary contest against then-Lt. Gov. David Dewhurst (R) but an easy general election win over former state Rep. Paul Sadler (D). If O'Rourke can maintain his fundraising pace -- Cruz does provide him a potent foil for Democratic donors -- he should have the resources necessary to get his message out in the huge and expensive state. We have been debating internally over which race, Tennessee or Texas, ranks third on the Democrats' Senate target list (behind Nevada and Arizona). Tennessee is fundamentally a more Republican state these days than Texas: Whereas Tennessee was 29 points to the right of the national two-party popular vote margin in 2016, Texas was only 12 points to the right, and the Lone Star State's demographic trends are the principal source of “Blue Texas” hope for Democrats. However, open seat races tend to be more difficult to hold for the incumbent party, which points to the Volunteer State being a better bet for Democrats. Additionally, Tennessee is far smaller and cheaper (for TV ads) than Texas, so it will be easier for national Democratic groups to spend on behalf of Bredesen than O'Rourke. The Texas Democrat is probably on his own, not only because Texas is expensive but also because Democrats are defending 10 seats in states Trump carried in 2016 and will have to commit ample spending to aid endangered incumbents. Nonetheless, if his fundraising up to this point portends future returns, O'Rourke may be capable of going it alone, although there's no question that Cruz is both better known and has the better party label in a state like Texas. Candidate quality may give Tennessee the edge in the debate over which state is truly Democrats' third-best Senate target this cycle: Democrats may have gotten the one Democrat who can still win in the Volunteer State. Bredesen carried every county in the state when he won reelection in 2006 9; the last Democrat to do that before Bredesen was Al Gore in his 1990 Senate reelection win. Bredesen is running as a centrist and a critic of the Affordable Care Act, which would be heretical for a Democrat in many other states. But Bredesen's bipartisan approach to campaigning might enable him to overcome the GOP lean of his state, running in some ways as an heir to Corker and someone akin to Tennessee's other senator, the pragmatic Sen. Lamar Alexander (R). Corker's hesitancy to endorse Blackburn wholeheartedly could speak to potential divisions in the GOP, with some business moderates and suburbanites possibly opting to back Bredesen instead. At 74 years old, Bredesen also may be a one-termer if elected, which might be an additional consideration for Republicans pondering a vote for a Democrat. But as our new rating reflects, the Crystal Ball still views Blackburn as a favorite. When Gore ran for president 10 years after last going in front of Tennessee voters in his 1990 Senate race, he lost his home state 51%-47% to George W. Bush. A similar type of outcome in 2018, with Bredesen narrowly losing 12 years after his last election, would not surprise us. 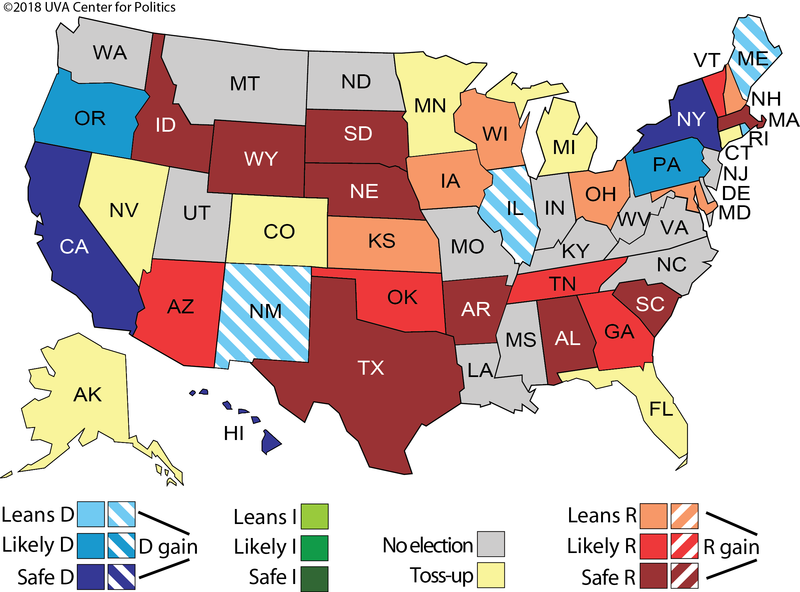 Ultimately, we just decided to move Tennessee to Leans Republican while maintaining a Likely Republican rating in Texas. Republicans are still favored in both contests, but currently we see Tennessee -- remarkably -- as the better Democratic bet. But we will reevaluate Texas at regular intervals. Our ratings changes in Tennessee and West Virginia reflect a more broadly competitive Senate map. We now have seven Toss-ups, five of which are already held by Democrats, which illustrates their challenge in 2018: Almost all of their most vulnerable seats are on the ballot this year, and they are defending 26 of the 35 races being contested (that includes seats held by independents who caucus with Democrats in Maine and Vermont). An additional four seats feature Leans ratings, one toward the Republicans thanks to today's change in Tennessee and three toward the Democrats. So that's 11 total Senate races in our two most competitive ratings categories. In order to win the Senate, Democrats need to win 10 of those 11 to get to 51 seats, or a net gain of two from the currently 51-49 Republican Senate. While possible, that still strikes us as a tall order even if the political environment is strongly in their favor this fall. On the flip side, Republicans could potentially come out of 2018 with more Senate seats than they hold now even if they are otherwise suffering losses in the House and at the state level. We have previously noted that we'll be using the gubernatorial results of five big states -- Florida, Illinois, Michigan, Ohio, and Pennsylvania -- to help determine which party got the better of this year's gubernatorial races. The state of play in one of those races got a little clearer Tuesday night, when Ohio Attorney General Mike DeWine (R) and former Consumer Financial Protection Bureau Director Richard Cordray (D) easily won their respective party gubernatorial nominations in the Buckeye State. We took a deep look at the expected DeWine-Cordray matchup last week 10, and we're holding at a Leans Republican rating there, although it could move to Toss-up before too long. Overall in these five states, Democrats are favored in Pennsylvania, where Gov. Tom Wolf (D) is seeking a second term (Republicans will pick a nominee next week), and Illinois, where Gov. Bruce Rauner (R) appears to be in deep trouble against Democratic nominee J.B. Pritzker. Republicans remain small favorites in the open seat in Ohio, and open Republican governorships in Florida and Michigan are Toss-ups, with competitive primaries in both states that won't be settled until August. One ratings change this week unrelated to the primaries comes in Massachusetts, which despite being one of the most Democratic states in the Union seems to like having Republican governors. We're moving Gov. Charlie Baker (R-MA), a GOP moderate who is a good fit for the state, from Likely Republican to Safe Republican. One of Baker's potential challengers, former Newton Mayor Setti Warren (D), recently dropped out of the race 11, another indication of the rather hopeless position Democrats are in against Baker, who narrowly won in 2014 but has been very popular in office. We had previously held this race as Likely Republican to allow for the possibility of a giant Democratic wave wiping out Baker, but at this point we don't even think a national Democratic tsunami would hurt him much. Gov. Phil Scott (R-VT) is just a little less of a favorite than Baker in liberal Vermont, but his strong position matches our Likely Republican rating in the Green Mountain State. We're also holding Govs. Chris Sununu (R-NH) and Larry Hogan (R-MD) at just Leans Republican, but their approval ratings are strong and their opposition uncertain. Republican incumbents in these four states remain well-positioned overall, even though three of them are among the most Democratic states in the nation, and the fourth (New Hampshire) is typically hyper-competitive and has voted Democratic in the last five presidential elections. So Republican gubernatorial incumbents seem to be doing fairly well throughout the Northeast despite a challenging environment. The one surprising upset in Tuesday night's primaries came in North Carolina, where Rep. Robert Pittenger (R, NC-9) lost a primary to pastor Mark Harris (R), who narrowly lost to Pittenger in a heated three-way primary two years ago. Meanwhile, veteran Dan McCready (D) easily won the Democratic nomination. Now that NC-9 is an open seat, and with McCready starting off with a huge $1.2 million to $70,000 cash on hand advantage based on pre-primary reporting, we're moving this race from Leans Republican to Toss-up. Trump carried the district by about a dozen points, so it definitely is more Republican than the state and the nation, but open seats can shift quite a bit from their previous performance in a midterm year. Part of NC-9, which extends from Greater Charlotte down the state's southern border, is adjacent to SC-5, where Republicans had a very close call in a special election earlier this cycle. In Ohio, state and national Republicans breathed a sigh of relief as two more mainstream GOP candidates, former NFL star Anthony Gonzalez (R) and state Sen. Troy Balderson (R), won the GOP nominations over potentially more polarizing alternatives in OH-16 and OH-12. Gonzalez's win, coupled with a loss by the Democrat who seemed likeliest to be able to put the GOP-leaning Northeast Ohio seat in play this fall, pushes OH-16 from Likely Republican to Safe Republican. Meanwhile, Balderson will face Franklin County Recorder Danny O'Connor (D), a favorite of state and national Democrats, in a nationally-watched special election in the Central Ohio-based OH-12 this August. We're holding the race as Leans Republican as a nod to the district's historical GOP roots but there's every reason to think the race will be hotly contested this summer.